French drains are a low-technology solution to divert excess water away from a building and allow it to soak into the ground. They typically consist of a trench up to 2 feet in width and depth, with a perforated pipe surrounded by gravel or small stones. The structure is hidden from view by several inches of topsoil laid on top of the drain. Calculating the quantity of gravel required to create a French drain requires basic math skills, a calculator and a tape measure. French drains are an effective way to remove excess water. Measure the trench, in feet, noting its length, width and depth. The trench will vary slightly in width and depth along its length. Take width and depth measurements at regular intervals, writing them down as you measure along the trench. Do not rely on your memory. Calculate the sum of the width measurements and divide by the number of measurements taken to calculate the average width. For example, with widths of 2, 3, 2.5 and 2.75 feet, the average width is (2 + 3 + 2.5 +2.75)/4, or 2.56 feet. Calculate the average depth using the method described in Step 2. Deduct 4 inches from the depth to allow for the layer of topsoil that will cover the drain. Determine the volume of the trench using the formula: volume = length x width x depth. Record this value to use later. Measure the diameter of the drainage pipe. This is usually 4 inches. The volume of the pipe is expressed by the formula: volume = pi x (radius^2) x length of the pipe, where pi = 3.1415, and the radius is half the width of the pipe, expressed in feet. For example, the volume of a 12-foot long pipe with a 2-inch radius is 1.09 cubic feet (3.1415 x (0.17 x 0.17) x 12 = 1.09). Deduct the volume of the pipe from the volume of the trench. 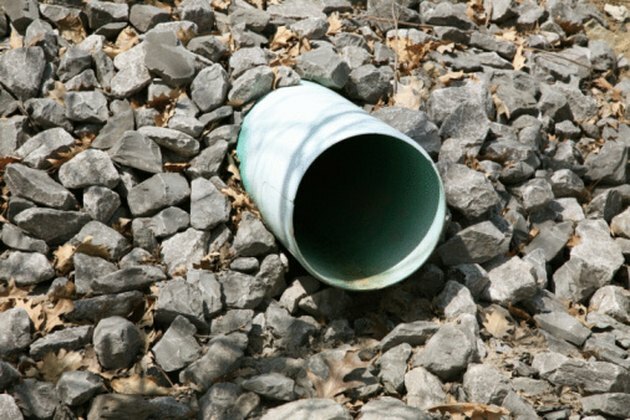 The result is the volume of gravel required to fill the drain. Gravel is sold in cubic feet or cubic yards, so round the value up to the nearest whole unit. One cubic yard of gravel is 27 cubic feet. Will a Clogged Condensate Drain Cause Loss of Cooling?